Hi all! I'm completely new to this, so please bear with me. 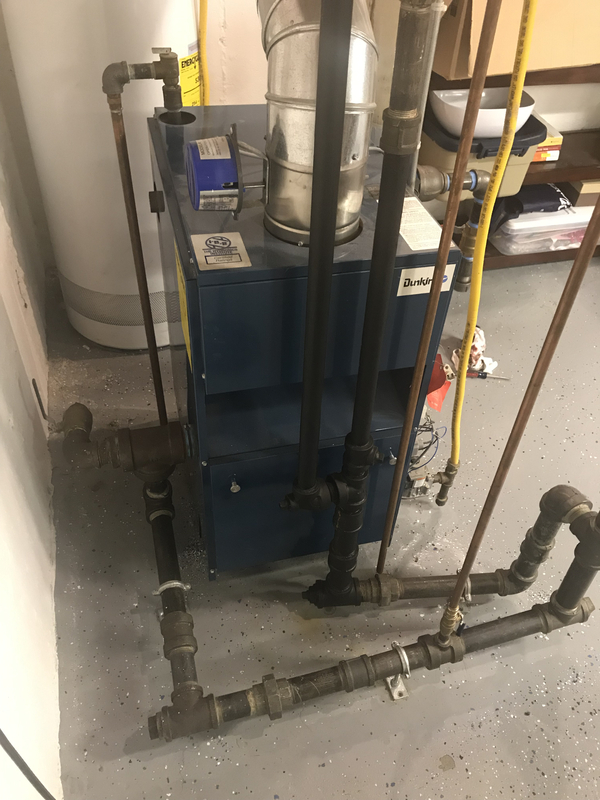 I recently bought a 2000 square foot, split level house, built in 1958, and it has steam heat, and the fin type, one pipe, convector radiators. My main issue is getting banging noise from the radiators, which are located in the bedrooms above the garage, and farthest from the boiler. 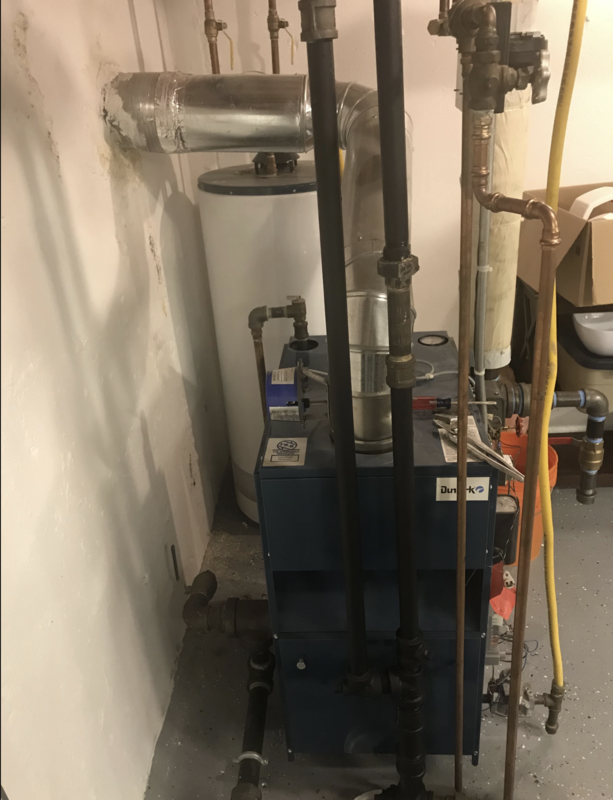 The steam boiler is a newer (5 year old) gas powered, Dunkirk model PSB-5D. I talked to a few plumbers, who didn't offer much help, and said things like "Yeah, steam is tricky", but not much else. 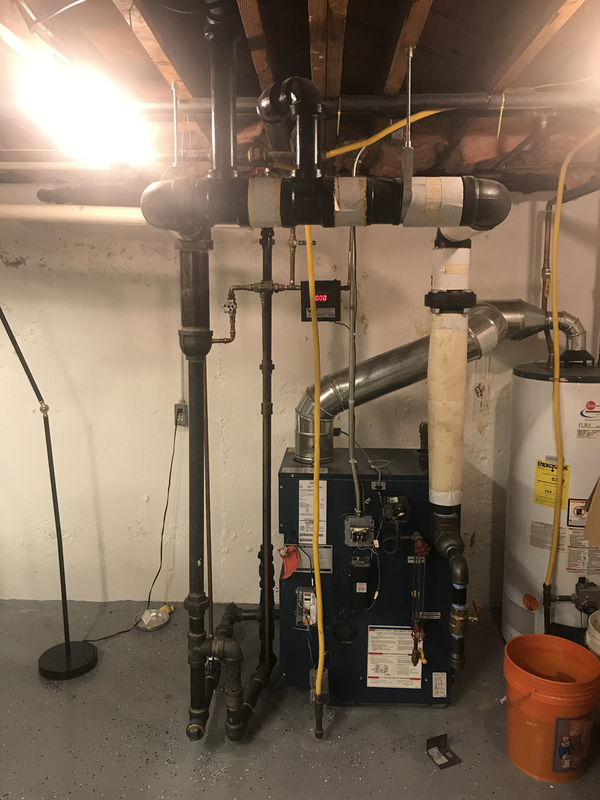 Most recently, I contacted a local furnace/boiler company to come take a look at everything. They told me that visually, everything looked like it was installed perfectly, with the exception of not having a skim tap installed. So, they installed a skimming tap, skimmed out the sediment and dirty water, and showed me how to perform the skimming myself. Skimming the water from the boiler did make a slight difference, but I was still getting the banging in the upstairs radiators. There are two radiators in each bedroom located above the garage...these are also the radiators that make the most noise. The pitch of the radiators was adequate, and the vents looked fine, but also spit out water. 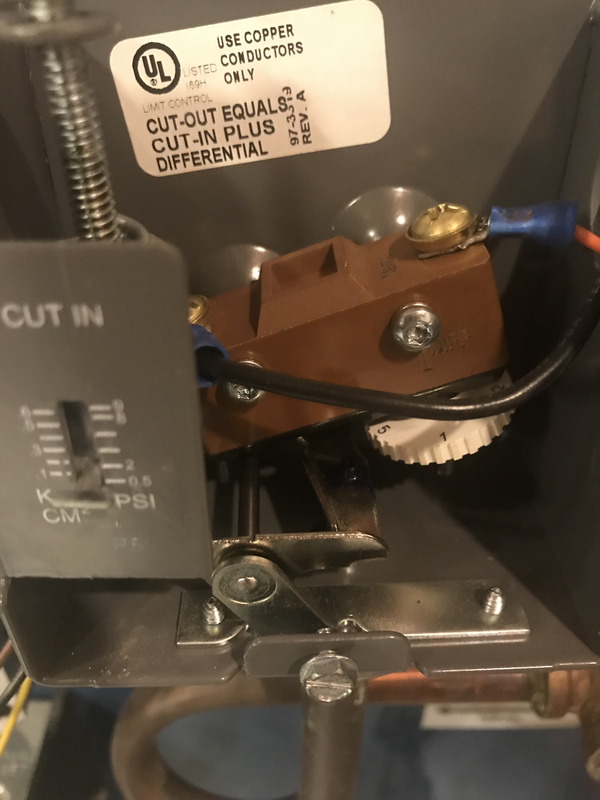 So, I figured I'd try to experiment with getting some new vents, and swapped the Vent-Rite model 11 for a Vent-Rite model 1, which is adjustable. The reason I went with an adjustable one, is because one of the other rooms upstairs had one, and that radiator never made any noise. Anyway, the problem didn't really go away, no matter what setting I made the adjustment to, on the vents. All the other vents in the house are the same size and use Vent-Rite model 11, but the living room facing the front of the house had a Maid-O-Mist vent, which spit a lot of water out as well, right into the level below, in the basement where the boiler is. I swapped the Maid-O-Mist for a Hoffman 44, but the water was still spitting, so I swapped it again for a Vent-Rite 11, and although the water spitting stopped, it started making some noise. I recently came across Gorton website, and then read something about making all the radiators in the house a balanced system, with the use of proper vent valves. 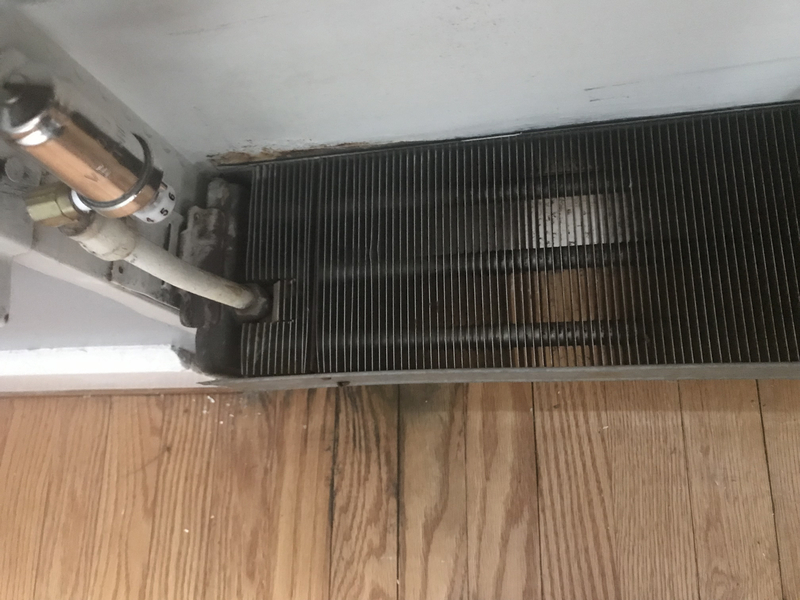 I'm also wondering if I need to change my main vents, since the radiator that is located about 30 feet from boiler below, in the basement was spitting all that water. 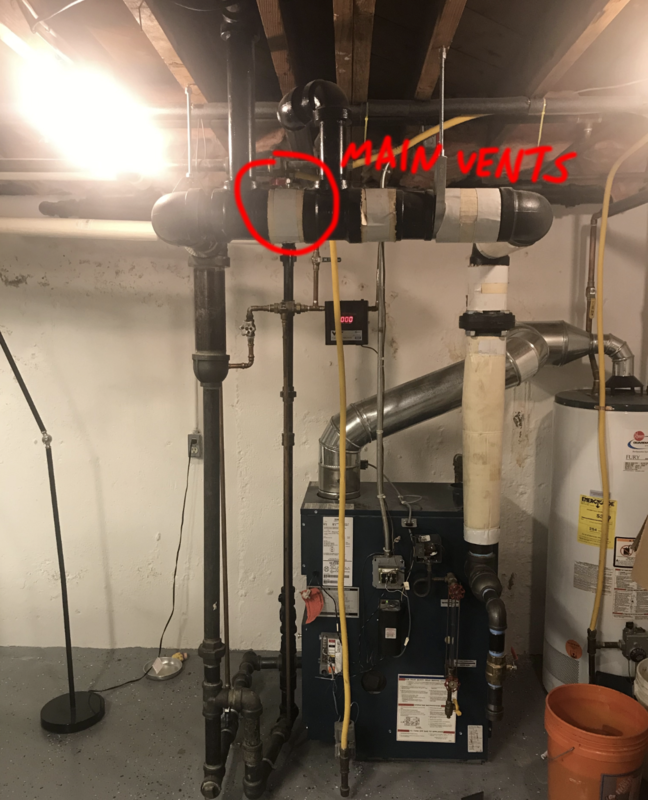 Currently, there are two main vents installed; one is a Hoffman 4A and the other is a Vent-Rite No. 35. Should I switch to Gorton vents? I'm reading that many people highly recommend them. I'm not sure what else to do. I skimmed the boiler water, about 5 times already, in the past 4 weeks...and I'm just guessing something is off with the radiator vents. I'm hoping to get this resolved soon, so any suggestions would be greatly appreciated. Thank you. You say these two problem spots are in a room above the garage? How does the steam pipe get to them? Is it in the garage? If so, how is the pitch on the steam feed pipe? 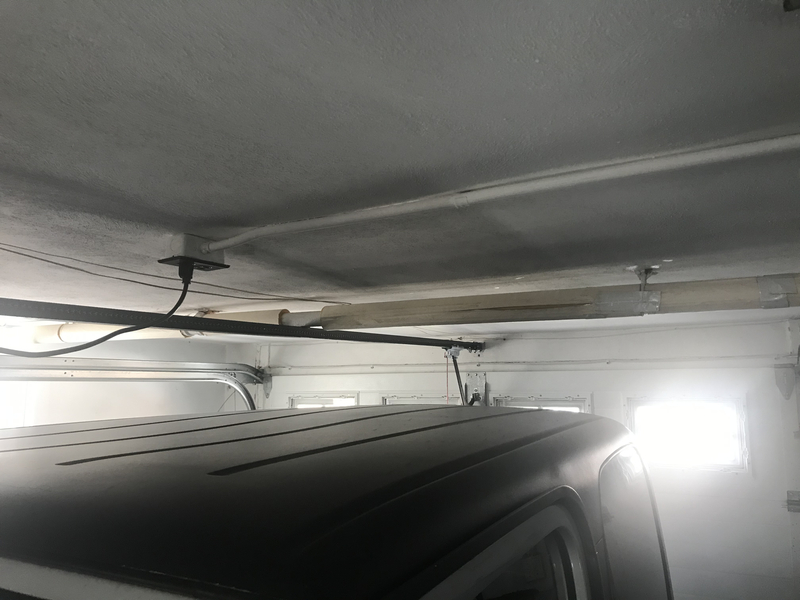 If it's in the garage, and the garage is kept cool, I would want to have greater than normal pitch (1 inch in 10 feet) on the pipe. Insulation or no, those pipes will have more condensate than is normally expected. 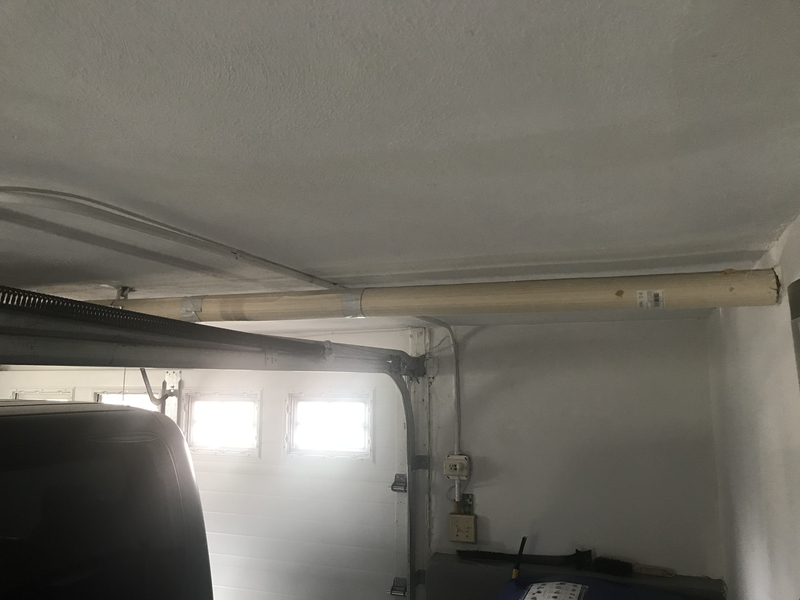 Second, it this is the case, those pipe must be insulated with a minimum of 1 inch fiberglass, and if the garage is really kept cool, try going to an inch and a half. Also, what is your pressuretrol set at? Has its pigtail been cleaned? Some pics of the boiler and its neear piping would be helpful. The steam pipe leading to the two rooms above the garage is in the garage, right below the ceiling. The pitch of the pipe seems to be adequate, and they are insulated. We have electric heat in the garage, and even with the garage heated, I’m still getting some noise. I’m attaching photos to show the piping in the garage. The pressuretrol is set right, and the pigtail was cleaned well too. Well, a few things. 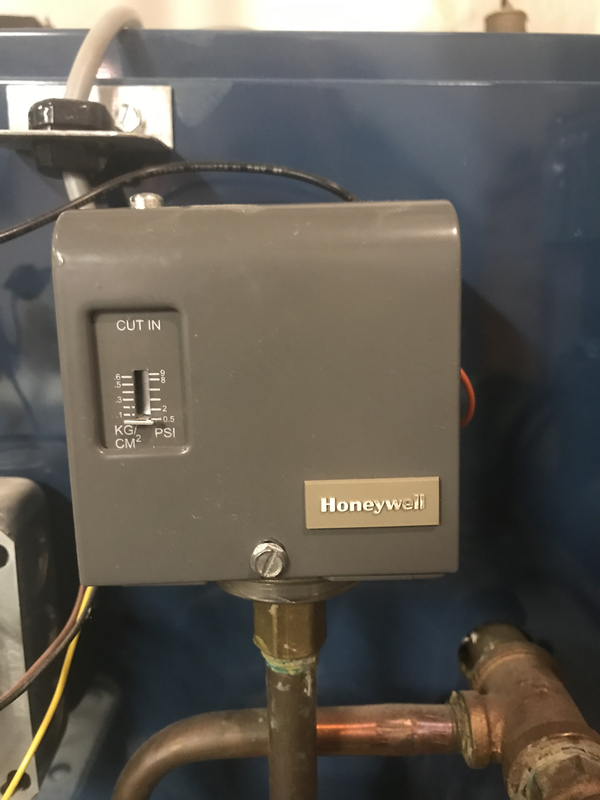 Number one, the pressure is insanely too high and seeing the pressuretrol set down low on the outside scale what is the dial set to on the inside? Two, the boiler is piped wrong, the header goes straight up into the system. Actually you don’t even have a header. It’s a Dunkirk, in most of our opinions is not a good steam boiler for steam because of the tiny sections and side steam outlets. However if sized right and piped with a good oversized drop header it can be made to work okay. 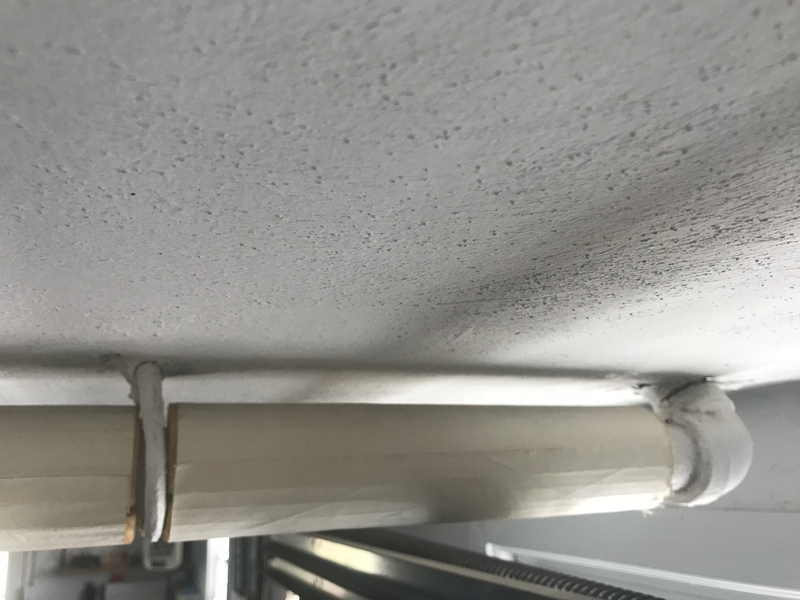 You say you have fin tube radiators, these are not meant to work on one pipe steam, it can work good however you need a different piping configuration where you run a second pipe out of the radiator down below to the wet return, or a loop seal created. It’s tricky but a good steam contractor will know what to do. No. It's not piped right. 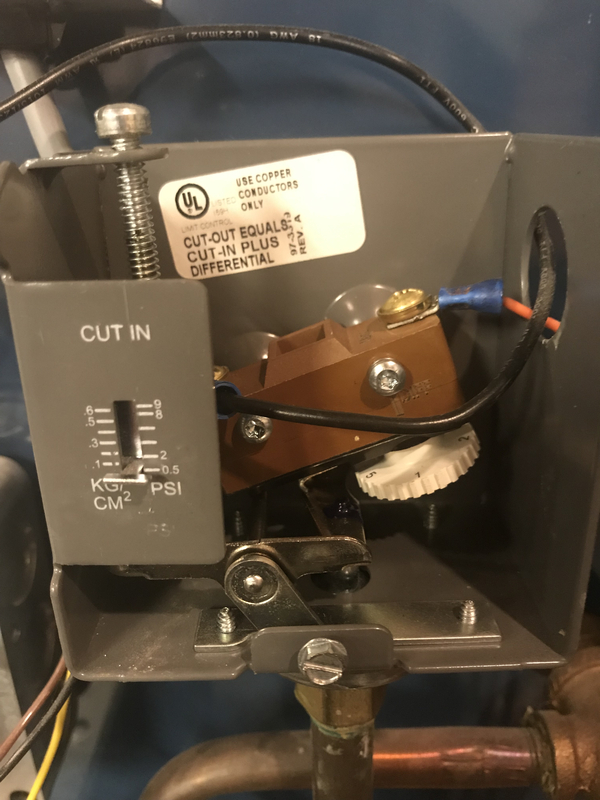 Who runs the return piping right in front of the burner service door? The returns are not configured properly and both riser tappings should have been used, not just one. 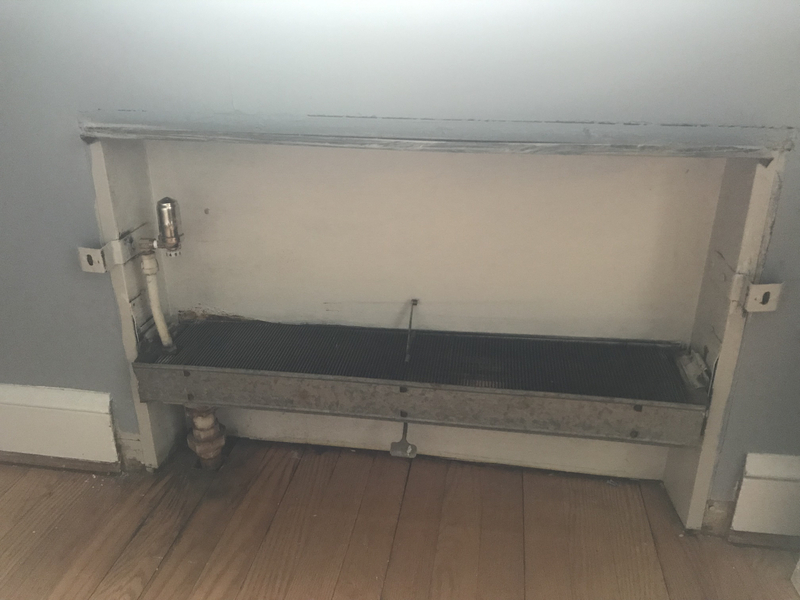 That particular type of boiler is very susceptible to water being drawn up into the riser because of its side tappings, that's why two risers are necessary. 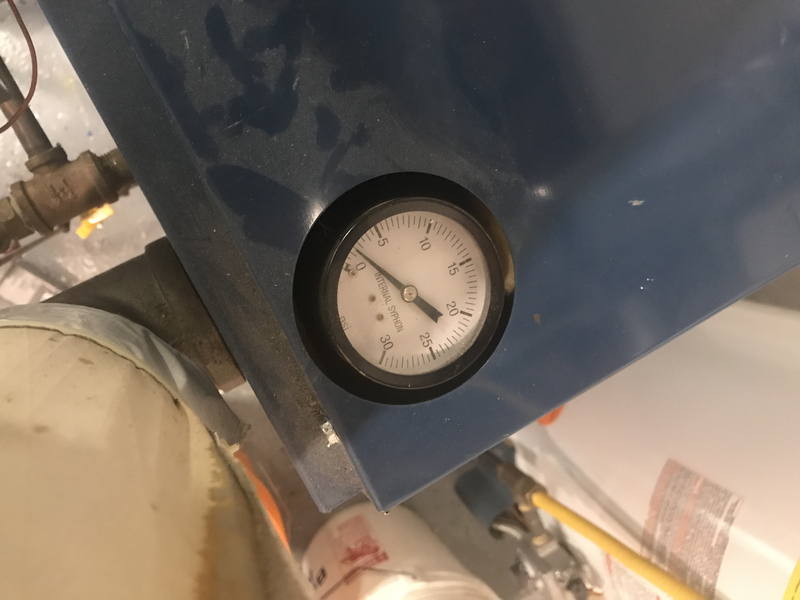 Your gauge is sitting on 8 psi, so either it's wrong or your pressuretrol is. You should never be above 2 psi. .5 - 1.5 is optimal. If the gauge is correct, that would also explain why you've got water in the mains which cause hammering. Is there a return line from the rooms above the garage or just the main? If it's the latter, then that is a counterflow main and it should have a MINIMUM pitch back toward the boiler of 1" in 10'. As Jamie said, it should have more when running across the garage where it's subjected to cooler temps. A couple more pics a little farther back from the boiler that show more of the piping would help. I’m attaching a few more photos. I was hoping that some of the issues would be due to the steam vents, but I guess that’s not the case. What are my options here? Ok, so those aren’t fin tube, they are convectors and yes can be used on one pipe steam. Your boiler piping isn’t all that bad, you do have a large header, however the return piping is a bit weird. Both risers should probably have been used. Only thing left is your pressure issues and to find out if your radiation matches or at least comes close to the boiler output. And check all those pipe pitches! With a level -- you need at least 1" in 10' on any of the "horizontal" pipes, and more wouldn't hurt. Ok. Thank you. I'll try those suggestions. Do you guys think changing out the vents would serve any better purpose in my situation? I'm just trying to see if there's anything else I could possibly do. From what I see, the vents are on the same side as the steam supply on those convectors. That is certainly a likely problem. As soon as steam hits them, out of that supply, it will close the vents and air can not get out. 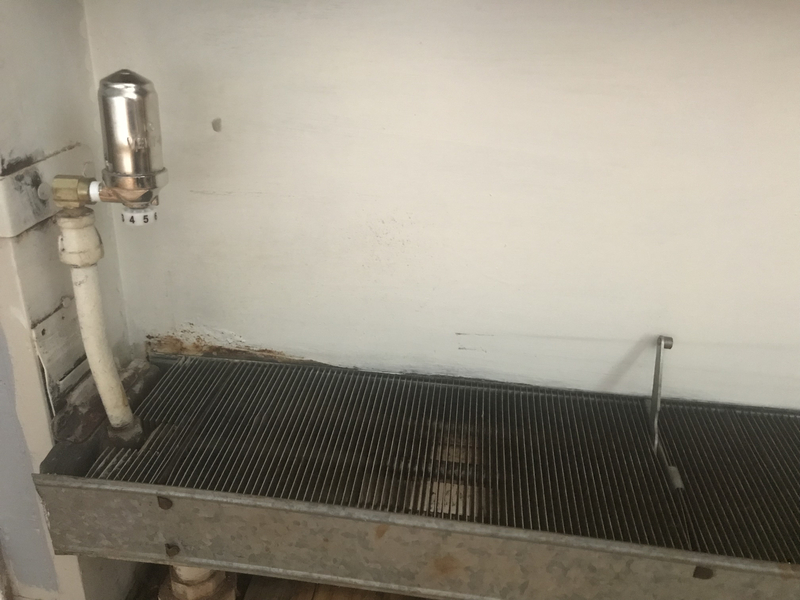 The vents should be on the opposite side of the supply pipe. Do those convectors get hot? How long has this been a problem? All the convectors do get hot, and there was never a problem with getting heat. The main issue I have is the banging noise coming from the radiators, and some water spitting out the air vents. Currently, I'm just experimenting with various things, to see if I notice a difference in anything. 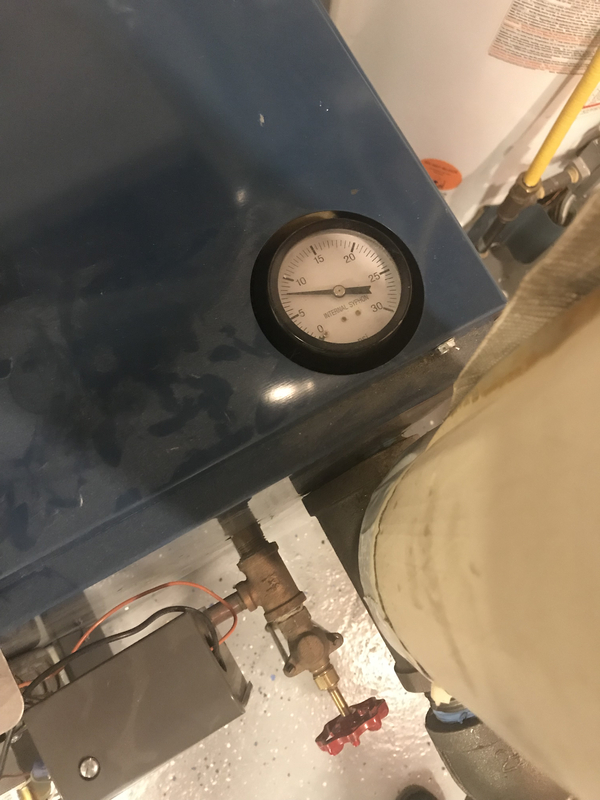 The pressuretrol may not be seeing the boiler pressure, There isa a pigtail between the boiler and the pressuretrol and that can fill up with sediment. Take the pressuretrol off and then the pigtail, clean out the pigtail and make sure there is nothing blocking the little hole at the base of the brass fitting on the pressuretrol. Also make sure there is no gunk in the boilker tapping the pigtail screws into. If everything is clear and the pressure still reads that high the pressuretrol might be shot and has to be replaced. Don't fiddle with the radiator vents till you get that pressure down. Your main vents are much to small, how long is each steam main? The convectors should have the vents mounted at the other end of the convector (opposite the steam inlet pipe). I will take a look at the pigtail, and make sure it's not clogged up. What should I be getting for a pressure reading when running, and when not? I figured that my main vents are too small. You can't see the two main vents in the picture, but they are at the top of the two pipes running up the side of the boiler. Also, the convectors are original, and had the vents mounted that way from when they were originally installed. They don't all make noise, just a select few, but aside from the noise, they heat up well. 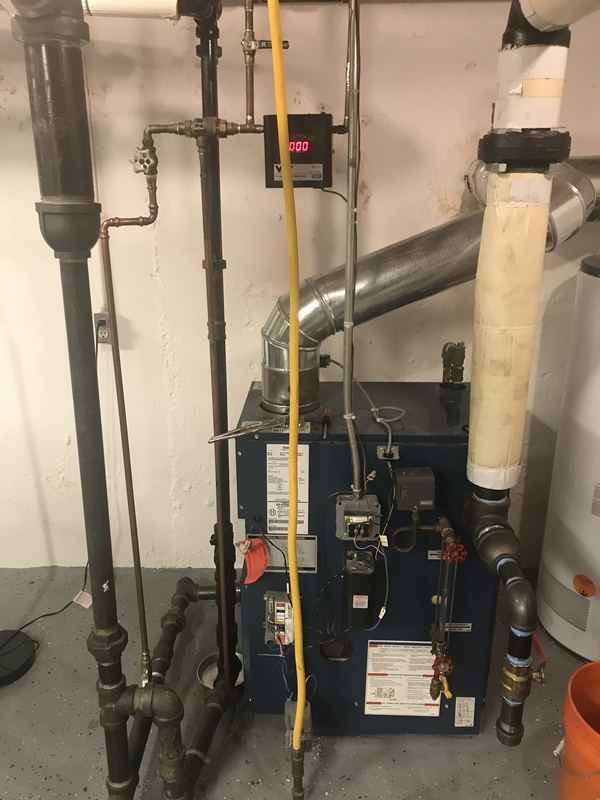 A single pipe steam system should run at 2PSI maximum, less would be better but modern pressuretrols won't adjust any lower. If possible the main vents should be selected to vent all the air in separate mains very fast and at the same time. If you have a 40 and a 20 ft main the 40 ft main would need about twice the venting. The main vents you have no will vent at about 0.15 CFM, Gorton #1 at 0.33 CFM, a Gorton #2 at 1.1 CFM, a bigmouth at 2.2 CFM. Noye the Gorton #2 costs about the same as the Barnes and Jones BigMouth vent so use the BigMouth unless you think water gets up to the level as the main vents. If the convectors worked ok just leave them be, there could be an internal path the connects the far end of the convector to that vent tapping. Drain and refill the boiler a few times to be sure any additives are gone and the then skim the boiler so any oils in the water are removed. One surefire way to tell a boiler needs skimming is if it works fine after being drained and refilled but starts to act up again after a few days.